The 4-Port USB 3.0 PCIe 1.0a Card from Sabrent is a host controller card that upgrades your desktop PC to SuperSpeed USB 3.0. 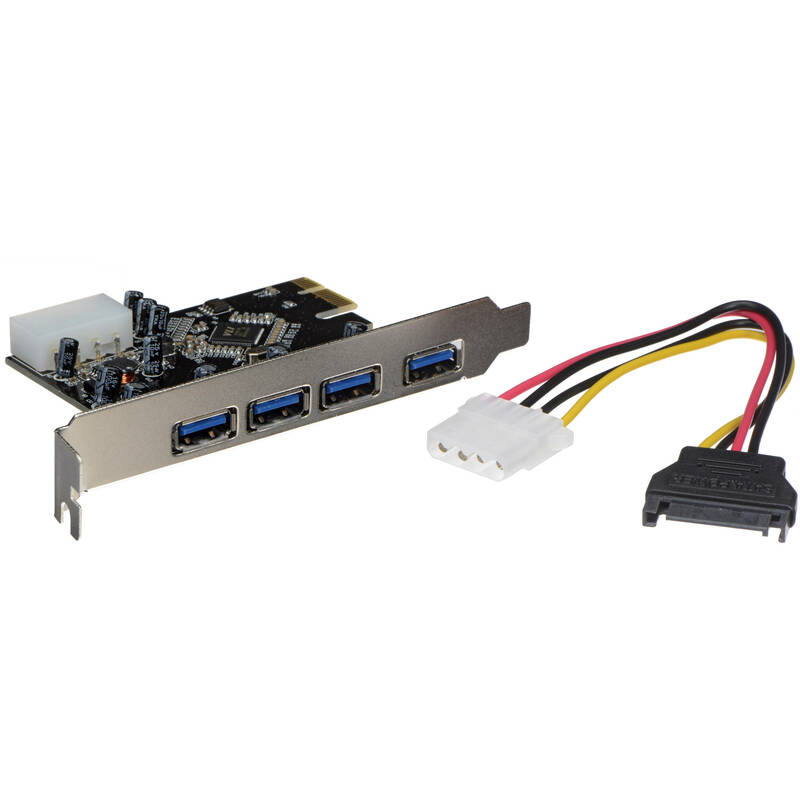 The card has four USB 3.0 ports that are reverse compatible with USB 2.0 and USB 1.1 devices. You can transfer files, photos, and videos at speeds of up to 5 Gb/s. It is PCIe revision 1.0a compliant. Box Dimensions (LxWxH) 9.0 x 6.4 x 2.4"
4-Port USB 3.0 PCIe 1.0a Card is rated 5.0 out of 5 by 2. Rated 5 out of 5 by arealcomputerdoctor from Works perfectly Windows 10 & Linux /w 1 small modification After installation, this adapter was instantly available for use in both Windows 10 & Linux support built into Linux kernel. HOWEVER, what was missing was an DIFFERENT additional cable! The included Molex to SATA would have worked - but there were no free SATA power cables in this system. So, I instead used a Molex WYE splitter to make the power connection from this card to unused power supply Molex connection. PERFECT! After doing research online, I found out that the external Molex power connection is NEEDED in order for all 4 USB 3.0 to be able to operate at maximum power of 0.9A. The article also stated that the power supply channel for the PCIe 1.0 could not provide enough power for this card by itself. Oh yes - with this adapter, and a Seagate USB 3.0 external drive B&H # SEEDT5TBV, file transfer was at a rate of between 15-27 MB range, taking about 3 1/2 hours to copy 260 GB this same group of files used to take 14+ hours to copy between the same USB 2.0 drive and another USB 2.0 drive. does this work with mac pro el capitan? This card is not Mac compatible.